An idiosyncratic sampling of the latest science papers. Forthwith, a few drops from the deluge of climate-related papers. The meridional overturning circulation (MOC) of the Atlantic Ocean is considered to be one of the most important components of the climate system. This is because its warm surface currents, such as the Gulf Stream, redistribute huge amounts of energy from tropical to high latitudes and influence regional weather and climate patterns, whereas its lower limb ventilates the deep ocean and affects the storage of carbon in the abyss, away from the atmosphere… Here we show that the basin-scale abyssal circulation of the Atlantic Ocean was probably reversed during the Last Glacial Maximum and was dominated by northward water flow from the Southern Ocean. This broader perspective suggests that the modern pattern of the Atlantic MOC—with a prominent southerly flow of deep waters originating in the North Atlantic—arose only during the Holocene epoch. 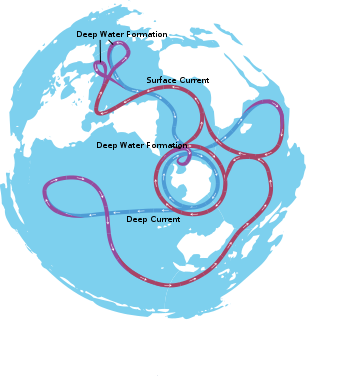 The global conveyer, or thermohaline system, with surface currents in red, deep cold currents in blue. Image by Avsa, courtesy Wikimedia Commons. The extreme record warming in the South Pacific and western Antarctica during 2009-2010 was likely amplified by a strong central Pacific El Niño. Central Pacific El Niños exhibit maximum warming in the central Pacific and have become more common and more intense in recent decades. (This as opposed to classic El Niños, which exhibit maximum warming in the eastern equatorial Pacific and which seem to be decreasing in frequency.) The authors note that if extreme warming such as seen in the 2009 south central Pacific becomes more common, the ocean-ice-atmosphere system in Antarctica could further destabilize too. The paper: Record warming in the South Pacific and western Antarctica associated with the strong central-Pacific El Niño in 2009-10. Geophysical Research Letters. DOI:10.1029/2010GL044865. 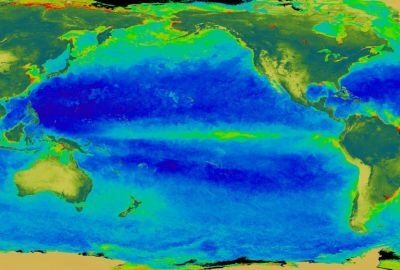 El Niño as seen through chlorophyll measurements. Credit: NASA/Goddard Space Flight Center, The SeaWiFS Project and GeoEye, Scientific Visualization Studio. Melt water flowing into ice sheets along fractures in the ice, crevasses, and large drains also carry warmth into the icy interiors, greatly accelerating the effects of a warming climate. The new paper in Geophysical Research Letters shows how the Greenland Ice Sheet responds to warming on the order of decades rather than the centuries as projected by conventional thermal models. The paper: Cryo-hydrologic warming: A potential mechanism for rapid thermal response of ice sheets. Geophysical Research Letters. DOI:10.1029/2010GL044397. 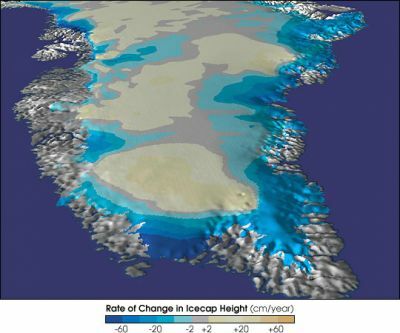 Rate of change in ice sheet height for Greenland. Credit: NASA.